We took a long walk along the Ohio & Erie Canalway with Adalay's parents to get out of the house and find a few geocaches. I brought the D700 along but didn't really find much to shoot (especially since we spent most of the time walking). 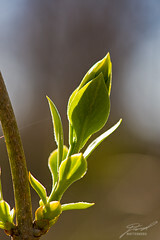 This bud on the canal side of the trail caught me attention in the setting sun.